Dinner: We were craving Asian food and were near Circle C Ranch in Southwest Austin, so we decided to try Blue Bamboo (12918 Shops Pkwy, Austin, TX‎ - (512) 263-8889‎) in Escarpment Village again and order a few dishes we hadn't tried before. 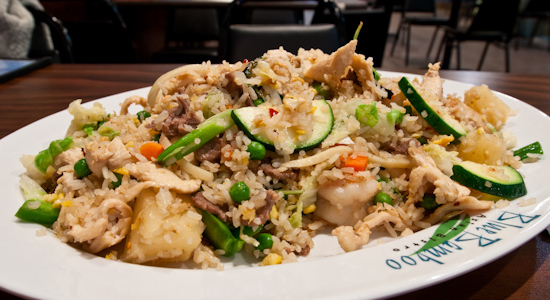 Bamboo Fried Rice Fried rice with beef, chicken, shrimp, egg, carrots, green peas, assorted vegetables, pineapple, basil, and chili peppers. 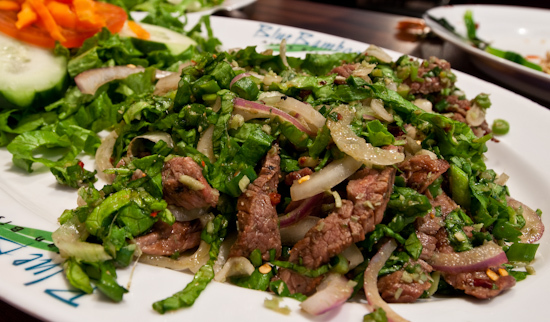 I enjoyed this dish - but the beef and chicken were tough and dry. The rest worked well together, especially when I got some basil and added a tad more salt. The pineapple pieces were nice - just cooked so they were still plump and lightly crunchy with texture (not mushy like pineapple that's been cooked down). Silent Mistress Grill marinated New York strips, flavored with dried chili, lime juice, cilantro, onions, rice kernels and fresh mints. This dish arrived and had the aroma of smelly socks (to my nose) and like petroleum products to Tina's. There was (in addition to the ingredients listed) fish sauce and lemongrass, but I've never known either to produce a smell quite like that. The dish tasted pretty good though - with a little acidity that brightened up teh beef and made it fairly refreshing to eat with white rice or the fried rice. 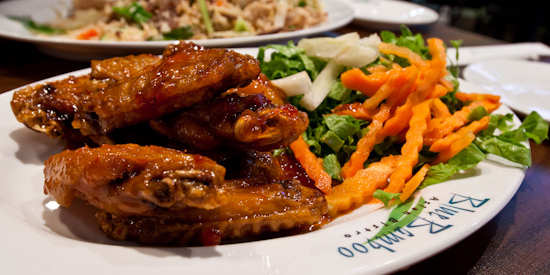 Blue Bamboo Wings Season chicken wings coated with our sweet & spicy glaze The glaze was quite good and the wings were nicely crisped, but the meat of the wings had a peculiar stale taste that neither Tina nor I could bear to eat. We mentioned this and the oddest thing happened - the owner came over and told us multiple times that the food was all fresh and she "warranties the chicken is fresh". We told her it tasted funny and asked if she would taste it (she refused) since we had trouble putting into words exactly what was wrong with the chicken. She repeated her "warranty" mantra as if she did not believe us. I don't know if it's because we're Asian and she's Asian - but we didn't appreciate being talked down to as if our palates were obviously wrong since she "warranties" her food. Getting lectured because we thought something was wrong with the food was not what we were looking for - especially since we spend so much of our time tasting food and we knew there was a strange taste. Later we asked our waiter if it could be the frying oil (old oil can pick up a variety of stale odors and impart that into the food rather quickly) and how often they change their oil. The kitchen informed us that they changed their oil at least every three days and often every other day - so it could very well be the frying oil. In any case, only two of the wings were consumed. This was a disappointing experience since we liked our first visit to Blue Bamboo so much. We'll probably come back again to try something else, but for now we'll have to down grade the restaurant a bit. 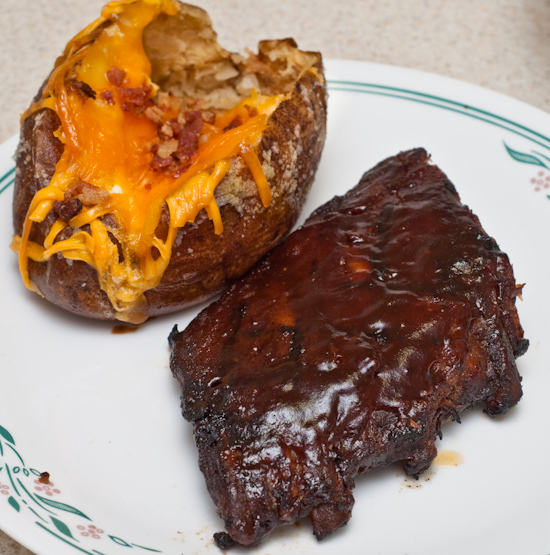 Lunch: I ate leftover pork ribs and baked potato from Texas Roadhouse. What does "warranty" mean? You can send it back and get a fresh batch? Even if she meant "guarantee" (as in, satisfaction guaranteed), you aren't satisfied. Sorry you had such a bad experience. I wonder what the outcome would have been if you had red hair. We've actually had a couple experiences where we haven't been treated like "customers" by older Asian people - don't know if it's a cultural thing. Some staff at restaurants in the Bay Area telling us we should order other food even though what I felt like was what I ordered and most recently Tina had an experience with a airline ticket counter where she and her Asian coworker were lectured by an older Asian woman. Sounds like it should be more like "Silent But-Deadly Mistress"! A silent mistress smelling like socks and petroleum?